Sony Classics Pictures web-site now has an official theatrical release date for the Jonathan Demme documentary "Neil Young Journeys". The date is June 29th. Naturally, this will elict howls of "Where is Trunk Show?!" in the comments section below. No one seems to know -- even the Director himself -- last we checked. 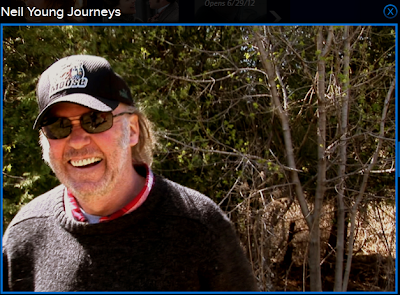 More on Neil Young Journeys Film Premiere at Toronto Film Festival. A-wooooooooooooooo! Where is Neil Young Trunk Show? Nice to see Journeys has come out of the TRUNK. Coming to a theater and coming to a theater near you are two different things. Trunk Show still hasn't come to a theater near me. Maybe they could do a "double feature" and I can drive to Toronto to see it?! Coming to a theater and coming to a theater near you and coming to your home theater are three different things. I was looking forward to have this on Blu-Ray by the end of march...?